AKBK Sustainable Resource Management Centre｜Malaysia Scheduled Waste 100％ recycling plant | Recycle | AMITA (English)｜Design a sustainable society. AKBK Sustainable Resource Management Centre is 100% recycling plant founded by AMITA KUB-BERJAYA KITAR SDN. BHD. (AKBK) which is a Joint Venture Company funded by the AMITA Group and Berjaya Group. We are providing services to wider range of local and Japanese companies throughout Malaysia since May 2017. AKBK provides Japanese Standard waste management services in Malaysia where the waste management risk is getting increased year by year. 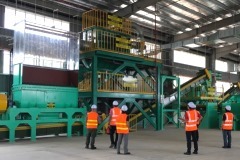 AKBK is able to receive 14 types of different Scheduled Waste codes and produce ARM(Alternative Raw Materials) and AF(Alternative Fuel) for cement industry in Malaysia, which is homogeneous and stable by taking advantage of our original blending technology and system. * Some kinds of hazardous and toxic wastes are categorized as "Scheduled Waste" in Malaysia. Please contact us if you have any inquiries. What is AMITA's unique "blending" process? Copyright © AMITA HOLDINGS CO., LTD.